March 26, 2018, 11:41 a.m.
Not to mention the slack STA. I still really wonder how they measure that at a 76-77 degree STA. 16.5" seat tube on a large is rediculous. March 26, 2018, 12:41 p.m. If the published ESTA is the same across sizes then it's probably measured at the seat collar. Which means that for an XL rider it's much much slacker than that at pedaling height. It's like they resisted modernizing their geo for so long and now they've delivered half measures. If you look at their geometry diagram, it looks as though they measure STA at the intersection of a line drawn up from the BB, passing the back of the ST and intersecting with the reach line if it were extended back beyond the stack/reach intersection. Since the BB is a fair distance behind the ST, this gives a pretty bad indication of what the actual STA will be. March 26, 2018, 2:29 p.m. The main takeaway is that this isn't a steep seat tube angle. March 27, 2018, 4:01 p.m.
Actually I think we've come to the conclusion that it IS a steep seat tube. 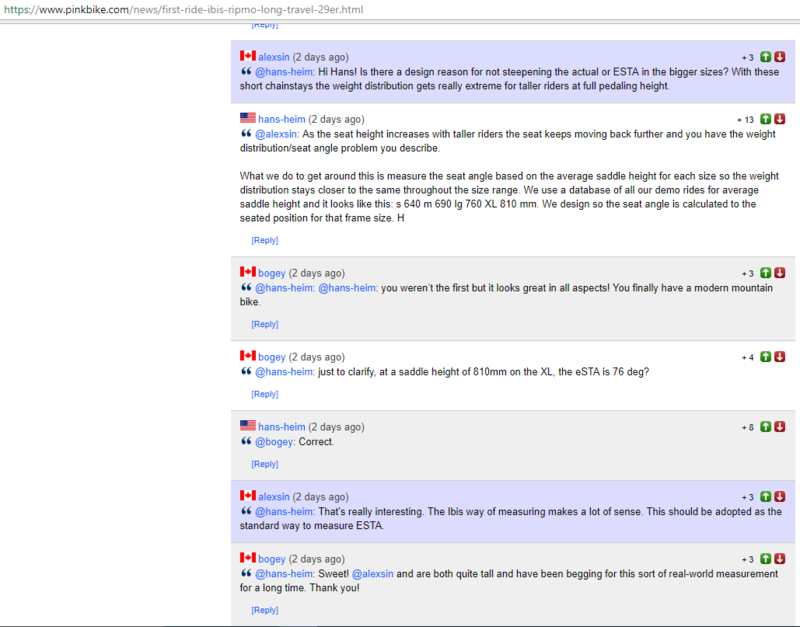 Its been mentioned in a couple spots, I think I heard it in Jeff K-W's YouTube broadcast, that Ibis measured seat tube angle at different extensions depending on frame size, XL was at 810mm, L at 770 I believe. March 28, 2018, 7:26 a.m. Agreed. Looks like they do vary their STA so that it yields the same ESTA across sizes. Good for them! March 28, 2018, 11:33 a.m.
Any bike without 75˚+ actual STA is unridable today. March 28, 2018, 1:32 p.m.
March 28, 2018, 3:11 p.m.
Have we decided that? Sure the ESTA is measured to each frame size, that is a start. The Actual STA on the other hand is not as steep as they claim given the information from the review that was posted here on NSMB. March 28, 2018, 3:35 p.m.
Last edited by: niels@nsmb.com on March 28, 2018, 3:51 p.m., edited 5 times in total. March 29, 2018, 8:53 a.m. I kinda like that...but it's different from the rest of the industry...maybe something they should talk about more in their marketing stuff. Thanks for posting the info Craw! March 29, 2018, 9:17 a.m.
All the other frame measurements are standardized except for ESTA. Ideally ESTA would be the angle of the line that passes through the BB center, the back or center of the seat tube and intersects with the Reach line. That would give a size-specific number. March 29, 2018, 11:48 a.m.
Why can it not be a line that passes through the centre of the seat tube? If bottom brackets and seat tubes all lined up like they did back in the hardtail days, then drawing a line through the BB would make sense. Most seat tubes are more or less straight these days, so having to deal with wildy bent or interrupted ones is not really a factor is it? BBs offset behind the seat tube make for exaggerated ESTAs when measured as you propose above. Last edited by: shoreboy on March 29, 2018, 11:53 a.m., edited 1 time in total. March 29, 2018, 12:05 p.m. I think I agree. So what if you drew a line from BB center to the center of the seatpost head at 4 different extensions (one for each size, or 6 if the brand makes XS or XXL) and took the angle of that? i.e. not involve the seat tube itself at all. Seeing how wildly those numbers varied would tell you a lot about how the bike fit. March 29, 2018, 1:52 p.m.
That is an interesting idea too. It wasnt what I was getting at though. Take the BB out of it (unless it is inline with the seatpost), and draw a line straight down the seatpost. Where it intersects with the imaginary horizontal line to the dropout is your STA. Please let me know if I am missing something, because this seems too obvious to me.